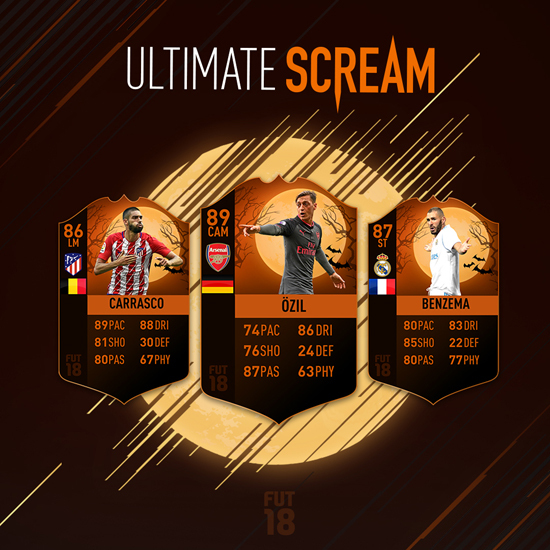 For a limited time only, hunt for ‘The Scream Team’, made up of players who for a limited time during Halloween receive scarily high ratings boosts turning them into FUT beasts. Over the Halloween period 23 player items will receive a spookily significant ratings boost. In this time, you can complete scream themed SBCs to gain rewards. The Scream Team is available in packs NOW, until Oct 29th! These are the 23 players included in FIFA 18 Ultimate Scream, available from October 20 for a limited time. Each player item is scary enough with permanently upgraded stats, but they also receive temporarily high ratings boosts during Halloween and specific periods throughout the season to make your FUT squad even more frightening.